Protecting your family or business is the number one reason for life insurance. Today, we’re going to compare 2 similar types of life insurance that can meet your coverage needs: Term life insurance vs Guaranteed Universal Life. Most comparison articles focus on Term vs Whole Life. However, this post will compare a unique and affordable permanent life insurance product in Guaranteed Universal Life insurance. There are other term lengths available such as annual renewable term, 5 year, 15 year term and 25 year term. Permanent life insurance is much more complicated. One of the confusing parts about it is that the majority of shoppers think that all permanent policies have cash value accumulation (CV). We’re going to show you that is not the case with Guaranteed Universal Life. *If you’re interested in CV- make sure to read our post on the best cash value whole life insurance companies. Shoppers need to know that Permanent Life Insurance is an umbrella term. That means that there are several types of policies that are under the label of “permanent” coverage. Why is Guaranteed Universal life Insurance different than all the other universal life policies? The main difference is that GUL is not made for cash value growth. It isn’t designed to build cash for you to use as loans or as an investment vehicle. So most permanent policies are made to build cash value, but not Guaranteed Universal Life insurance. Guaranteed Universal Life is nicknamed “Lifetime Term” as it is designed to provide coverage for your entire life- but setup like a term policy. 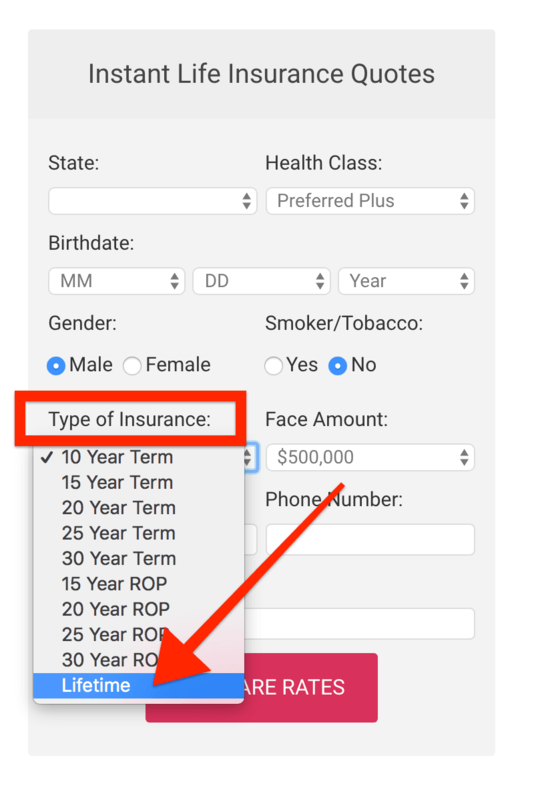 GUL allows you to design your policy to provide coverage to a specific age. That means you can buy a policy to cover to to age 90, 100, 110 or 121 (the maximum age). Once you’ve decided that you’re not looking for a life insurance policy that has cash value growth- you have 2 main options to choose from. Buy a term life policy from 1 through 35 years. Buy a guaranteed universal life insurance policy. Your premiums are level and guaranteed with Term and GUL. Both Term and GUL are not made to accumulate cash value. There are some GULs that build a little cash, but DO NOT access it. You can lose your guarantees if you were to access the cash. Also, the cash growth is minimal. Guaranteed Universal Life and term life are simple products to understand. Receive coverage for the length of time stated in the policy. How do GUL and Term differ? There are two major differences with term life and GUL: Price and Time. Let’s look at those with some examples. Guaranteed Universal Life will typically be more expensive compared to term life. The basic reason is you’re getting coverage for a longer period of time. Longer coverage = higher cost. Example: You’re 40 years old and need $500,000 life insurance policy and you want to compare Term and GUL rates. 30 year term will cover you for 30 years. GUL to ‘Age 100‘ will cover you for 60 years. The GUL will cost you more because you’re getting an additional 30 years of life insurance. The main difference between term and GUL is time. In other words, how long your policy can provide you coverage. Term Life can provide you coverage between 1-35 years depending on the company. Guaranteed Universal Life can provide you coverage up to the ages of: 90, 95, 100, 105, 110, 121. (Not all companies offer every age). One of the most common requests we receive is for shoppers in their 60s who want to buy 30 year term life. Unfortunately, the vast majority of life insurance companies don’t have 30 year term, but there is a way to work around that with GUL. Purchase a GUL to Age 90. This strategy can be used for any age. If you’re 65 years old, buy a Guaranteed Universal Life to Age 95. If you’re age 70, buy a GUL to Age 100. In order to get instant guaranteed universal life insurance quotes, simply select “Lifetime” from the ‘Type of Insurance‘ option. On the results page you’ll receive GUL rates from Ages 90-121. Use the same quoter and simply choose the term length that you desire. You may not get results if you’re age 60 or over and choose 30 year term. Be sure to run GUL quotes as described above. 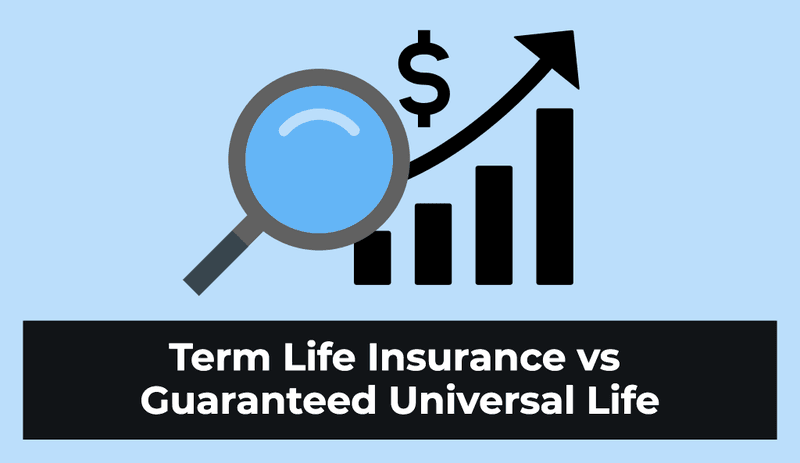 Should I buy Term or Guaranteed Universal Life? The most common life insurance strategy is to buy term and invest the difference when you’re young. It’s a great strategy. So should you buy term, GUL, or both? Remember, the entire point of life insurance is to protect your loved ones or business. Your family depends on your income now and in the future. Your goal is to make sure they won’t be in a financial disaster if you were to pass away. Perhaps the best way to avoid disaster is a combination of Term and GUL. A great life insurance strategy is to provide short term and long term coverage at the lowest rate possible. This is called laddering. We use the laddering approach by providing short term coverage for 20 or 30 year terms and long term coverage with GUL. This will be designed to use a higher death benefit to protect things such as mortgage protection and income replacement during your early professional years. Long term protection for a lesser death benefit can be covered with a GUL policy. Laddering isn’t always the best strategy. Everyone is unique and your specific situation may or may not need the laddering approach. GUL is a wonderful product because it’s a great “middle ground” life insurance product. GUL can provide longer coverage compared to term life. GUL can provide lifetime coverage for less money compared to other permanent products (Whole Life & Traditional UL). GUL also makes sense as a way to protect you from the unexpected. Your goal is probably to invest while you’re young and not have a need for life insurance in your golden years. In most situations, your retirement and investments will provide you the income you need when you stop working. As we all know- things don’t always go like we want them. You could run into financial difficulties at some point or have serious health problems along the way. A guaranteed universal life insurance policy can help cover these long term unexpected situations. Not in the traditional sense. In other words, your main goal with buying life insurance shouldn’t be to buy it as a way to make money. It should be bought to provide a death benefit. However, life insurance is an investment in the sense that you’re buying a product that will guarantee a payout to your beneficiary without any risk from the markets. Let’s look at a 60 year old man in decent health who would like to leave an inheritance to his family. It not uncommon for someone to have a large amount of money from a variety of reasons- and not know what to do with it. If our 60 year old paid an annual premium of $6900 into a guaranteed universal life policy to age 100- he would get a death benefit of $500,000. That’s a pretty nice return on investment. Another way to look at it is this: If he were to pass away at any age before age 100, his beneficiary would be paid tax free. The death benefit amount would remain at $500,000 and is guaranteed. One of the best GUL companies is Protective Life. They offer great rates and even offer a Single Premium GUL. With a single premium GUL, your return would be even better than the example above. To recap: Term life insurance is the lowest priced life insurance product. Life insurance companies have done the math and know most people will not die before their term policy ends. Guaranteed Universal Life is a little more expensive because it’s a permanent product and provides lifetime coverage. We work with life insurance shoppers with varying and unique situations. There are many people in their fifties, sixties and seventies who had life insurance in the past and their policy happened to lapse. Guaranteed Universal Life is a great way to provide protection at this time. Is GUL for everyone? No, however it solves the life insurance problems for many. You now should have a better idea of term life insurance vs Guaranteed Universal life and how they work. If you’re still not sure, make sure you reach out to a professional independent life insurance agent. That way you can get unbiased advice, options, and information about the best life insurance companies that you can qualify for. If you’d like to learn more about these topics, be sure to read our articles about life insurance types, payout amounts, and rates by age. Life Insurance Blog is an independent life insurance broker that provides unbiased recommendations because we work with over 40 of the best rated companies. We never push one company over another and ask you the right questions in order to provide you the best carriers. Give us a call today. You can also visit our Life Insurance Calculator page to see how we can help you.